True to its name, Michelin-recommended Naam Thai, inside the Grand Lapa Macau, oozes the soothing feeling one gets when surrounded by water. That’s no different at this aptly named restaurant, named after water with its décor setting the mood. Walking in, you pass into a bubble of tranquillity as you become immersed in the restaurant’s exquisite surrounding, incredibly reminiscent of Thailand. The menu will send your taste buds through its abundance of rich flavours, using a variety of herbs and spices. 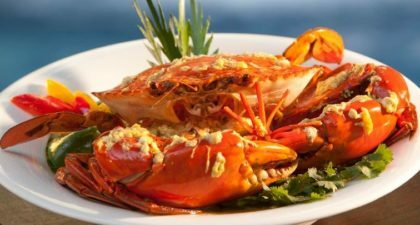 Must try dishes include the Choo Chee Kung Mungkorn (Stir-fried Lobster in a Red Curry Sauce) and the Pla Ka-pong Nueng Samoon Prai Rue Manow (Steamed Red Snapper with assorted Thai Herbs). Reservations can be made via the website.